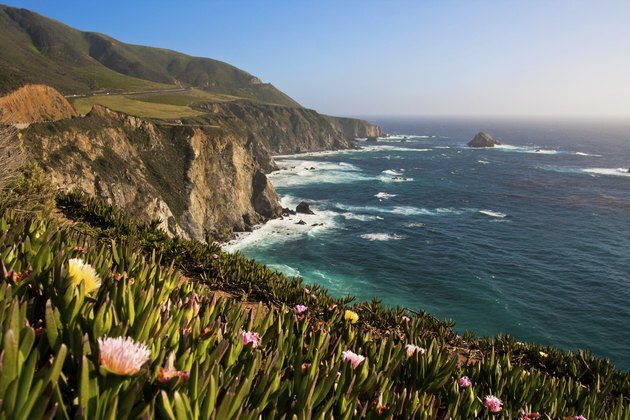 Along the California coastal region from Baja to the northern coastal redwoods, a diversity of plants thrive in the gusting ocean winds, sea salt spray and shifting temperatures. Coastal land forms also play a role in wild plant cultivation. 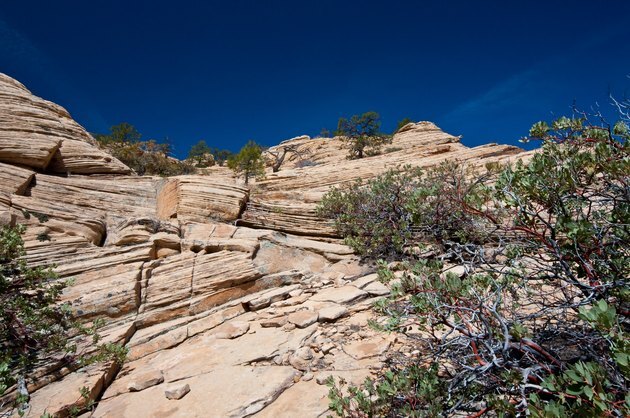 The California coastal region features rocky outcrops, sand dunes and chaparral scrub in which plants have to adapt to their surroundings in order to thrive. California Oat Grass (Danthonia californica) is a native bunchgrass that adapted to a diverse climate of cool and humid conditions along coastal areas. This transitory perennial has dense leafy tufts. Considered slow-growing, it reaches heights of one to two-and-a-half feet. Leaf ends bend at an angle with the upper blades "long and flat to in-rolled," while fine hairs form at the bottom of the leaf collar. Blooms appear in May or June, with three to eight florets per spikelet. The Western Bracken Fern (Pteridium aquilinum) is a coarse and wiry perennial. Each dark green leaf develops from a horizontal underground stem (rhizome) supported by a rigid leaf stalk, according to the USDA. Covered with silvery gray hairs, these "fiddleheads" can grow one-and-a-half to six-and-a-half feet in height. 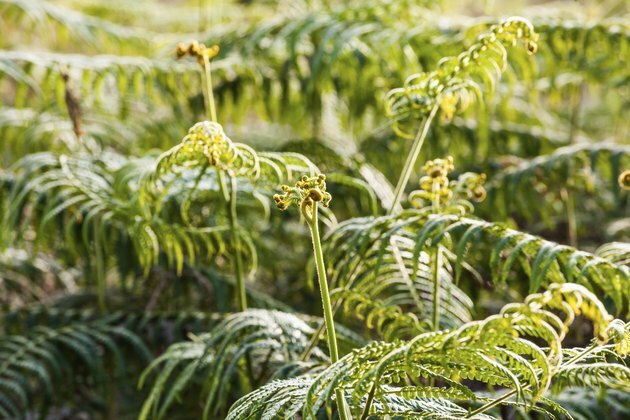 Instead of producing flowers or seeds, the Bracken Fern produces spores and creeping rhizomes. Several lozenge-shaped leaflets make up one main leaf. The Western Bracken Fern has a low toxicity if ingested. Symptoms include high fever and weakness. The chaparral plant, Coyote Brush (Baccharis pilularis), is a woody perennial shrub that appears in thickets, sea cliffs and sand dunes of coastal California. The gusty ocean winds and sea spray naturally shape Coyote Brush. Adaptable to these elements, it retains small, rigid grayish green leaves with jagged tips. Somewhat elliptical in shape, these leaves maintain a waxy texture. Small white or yellow flowers appear in clusters with round and flat heads from July to October. The Little Sur Manzanita (Arctostaphylos edmundsii) can be found along the coastal bluffs and canyons of coastal California. This perennial evergreen shrub possesses small, light-green leaves with a hint of red. Densely clusters of pink blooms appear from November through January. The Manzanita yields red berries that, according to wildflower.org, were used by indigenous tribes to make a drink resembling cider. The lobed Sea Rocket (Cakile edentula) is found along the sandy shores and coastal dunes of California. The Monterey Bay National Sanctuary states that the sea rocket, "a native of eastern North America, was introduced to the San Francisco Bay area around 1880, probably from ship ballast, and spread to San Diego within 30 years." The plant spreads low to the ground in a mound. Its many branched fleshy leaves produce mauve and occasional cream colored flowers which lengthen into fruit. 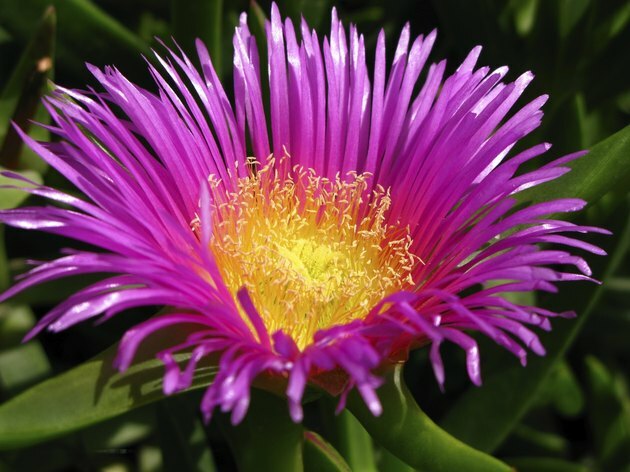 Native to South Africa, the succulent Sea Fig (Carpobrotus chilensis) grows on California's sand dunes. This succulent stores water within its long, swelled leaves as it trails outward, low along the sand. Each succulent blooms from May to July with one to two small pinkish-rose colored flowers.